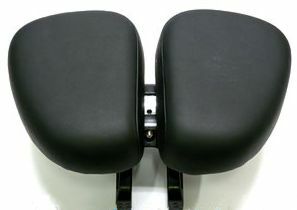 Dual pad seat rated to 350 lbs. Doctor recommended Pressure Relief Seat. Doctor recommended pressure relief design. Each seat pad is: 4" wide x 5 1/2" front to back. The two seat pads move slightly with the weight and down stroke of the rider, keeping legs fresh mile after mile. Enclosed in the base of each seat pad is a stiff elastomer (cushioning plug ) which allows the pads to stay with the rider�s down stroke providing a very stable ride. The Easy Seat Deluxe is a unique seat. It may take time to adjust to the firm dual flexing pads. Try it for a couple of weeks and see.